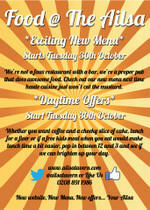 The Ailsa Tavern has changed managers and is going to relaunch on Tuesday, 30 October 2012 with all new food and updated nights for music and quizzes. Changes include the addition of an Irish and Scottish music night on Thursdays and £5 lunchtime food specials. Monthly art workshops with local artist Anna De Polnay. Each workshop has a different theme: Halloween, Christmas and fairy tales to name a few. A fantastic opportunity for mums, dads, grandparents and kids to create individual or collaborative art in a fun and informal atmosphere. More trouble for the Twickenham Station plans. Based on the tireless work of the Twickenham Residents Action Group, there will be a High Court Judicial Review regarding the Richmond Council approved plans to redevelop Twickenham Station. We have included the Council and the TRAG’s press releases to let you figure out if it is horrible or wonderful news. Teddington Lock and Sandys the fishmongers in Twickenham will be two of the many images depicting working life in modern Richmond upon Thames featured in the Environment Trust’s annual Art Auction on November 8th. Planned engineering work is taking place across the South West Trains network on Saturday 26 and Sunday 27 January 2013. All lines in the Twickenham area will be closed all day Saturday, 20 October and Sunday, 21 October 2012. With accompaniment from violinist Jonny Bevan and saxophonist Julian Costello. Now in its’ 21st year, the Richmond Literature Festival is a calendar highlight for the borough and beyond. This years’ programme features a wide range of authors, commentators and leading figures from politics, journalism, sport, theatre and television, including Andrew Marr, Jack Straw and Prue Leith. The programme also celebrates the unique events of 2012 with events by historian Tracy Borman and Olympic rower Greg Searle. There will also be special poetry events from Roger McGough and a celebration of Alexander Pope at Marble Hill House. Come along for a delicious evening of fabulous food and fundraising for The Royal Marsden Cancer Hospital. Hosted by The David Adams Leukaemia Appeal, a local charity based in St Margarets. Two course dinner, poppadoms tea/coffee. £22.50, includes a £15 donation to The Royal Marsden Hospital. Feel the music and let loose! Whatever your inspiration… the need to get fit, weight loss, or just to have some fun! Join the party & move to some great Latin inspired music! Suitable for all fitness levels!